We always recommend our guests to take a taxi from the train station. It takes about 10 min and costs Euro 9,--. If you want to go by bus: take bus number 2 until "Esshaverstraße", than you have to cross the street, take bus 4 until "Schmiedinger Strasse" Cross the street, you see a small street without cars (Hafnermühlweg) after 80m you reach "Lieferinger Haupstraße", turn right and walk about 300 m on it, than you see the pension on the left side. Take the Salzburg Mitte exit off the Autobahn and head for the Centre (Zentrum) – directly after the first traffic lights, turn RIGHT onto Preishartlweg. 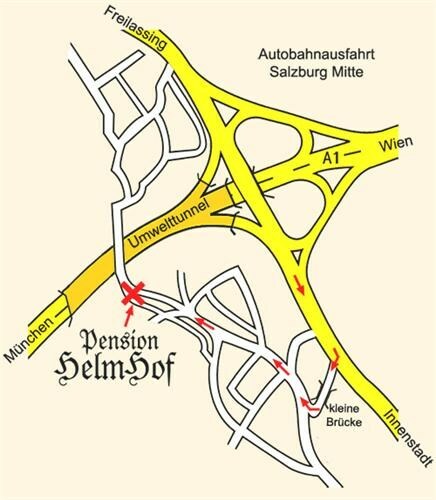 Cross the little bridge, turn RIGHT again onto Lieferinger Hauptstraße; the pension is 300 metres further, on the left hand side.